There are multiple reasons you may be dealing with cats fighting in your home. If you live in a home where multiple cats reside, chances are you've dealt with a few scuffles here and there. Cats, similar to human siblings, even if they get along most of the time, tend to have occasional disagreements while living under the same roof. Cat fights may break out mostly during meal time, play time or nap time. Since cats are territorial and possessive at times they may fight over a food bowl, playing with the same toy or not wanting to share a comfy, resting place. Below are several reasons why cats fight, social ranking and territorial aggression, misdirected aggression, play aggression and sexual aggression. Social ranking is one of several different reasons why cat fights, especially males. Neutering a male cat can minimize fighting between multiple males in the household, but not always. Males will often fight for social ranking to determine the alpha male in the household. Both males will fight, which includes howling, hissing, chasing, biting, until one eventually gives it, making the winner the king of the castle. This time of fighting usually doesn’t last long or require human interference, unless the fighting is going on for an extended period of time. Male cats aren’t the only ones who fight for social rankings, female cats also like to let other females in the home know whose boss, and may fight with another female in the house especially if they feel their space is being invaded. Cats also fight due to territorial aggression. This type of fighting usually begins during the ages of 5-10 months. Cats tend to mark their territory and feel threatened when another cat invades that territory. Once one cat feels like their space is being invaded, or a favourite spot of theirs is being occupied by another cat in the household, they may growl or hiss, which can then result in a cat fight. In a multi cat household to prevent cat fighting, or at least reduce it, it’s very important to make sure each cat has their own food bowls, beds and even cat litter box. In our household, each of our cats have their own special place to sleep that they have marked as their territory, fighting rarely occurs, but when it does, it’s due to one cat, usually the oldest, laying in the other cats special spots, because she’s convinced that she’s boss and should be able to sleep anywhere she pleases. Misdirected aggression among male and female cats sometimes occurs. At times we as humans may take out our angry on a spouse or someone close to us, when we are angry at someone else or just having a bad day, same applies to our cats. For example and indoor cat may see a bird outside that they want to attack and as a result of their frustration in not being able to go outside, they redirected that frustration unto one of their cat housemates. As cat owners there’s nothing that can be done to prevent this type of aggression which can easily turn into a cat fight, you may need to intervene if necessary to stop the fighting and place the cats in separate areas to give them both a chance to calm down. 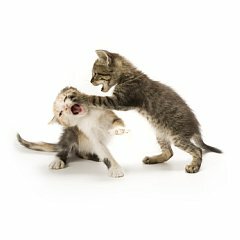 Cats fighting is one of several cat behavior problems, to find out about others read Common Cat Behavior Problems. Play aggression is particularly common amongst kittens. Kittens are extremely active and filled with energy, and sometimes all that extra energy results in a lot of play fighting and non serious scuffles. These fights usually end on their own, but can sometimes turn into a more serious fight which requires human intervention. It's important to keep in mind that this type of cat fighting is an instinctual behavior that is meant as a way for kittens to practice predatory behaviour. It's easy to make fun homemade toys for your cats, visit Easy To Make Homemade Cat Toys. Sexual aggression can occur from males to females or females to males. Both may participate in nape biting, an act that is usually done just before mating. Males may pin a female down and briefly mate in such a way that the female can't turn on him or fight back. Females may become aggressive if a male approaches her, but she is not ready to mate, a fight may occur. Distraction is one of the quickest and simplest ways to break up cats fighting. For one, most cats love toys, especially younger cats. Cats that show play aggression can express that aggression by playing with cat toys. There are many cat toys that are designed to encourage your cat’s natural instinct to hunt, run and chase. Playing with your cat and provided toys for them to play with helps to reduce the amount of cats fights in the home. Keep the family scent on your cat even after vet appointments. Cats know each other by their scent, if your cat goes to a vet appointment and comes home smelling like other pets at the vet office, your cat will be considered him/her a stranger, which may lead to other cats in the home feeling threatened and ready to attack, make sure to bring one of your cat’s blankets along to the appointment and rub it on your cat to keep him or her smelling like their old self. Making noise to distract cats fighting is also effective. Clap your hands while saying firmly, “No!” Throwing an object, like a toy in a different direction is another way to draw their attention away from the fight. In few cases, aggression in cats may need to be treated due to an underlying medical condition. Consult your veterinarian about your cat's aggressive behaviour to make sure there isn’t an underlining medical reason. Cat Sounds: Interpreting What Your Cat's Saying - Cats are able to make hundreds of different sounds to communicate their needs. Here we discuss five major cat sounds, what your cats trying to say and how to respond. How To Stop Cat Spraying - Discussing why cats spray and how to stop cat spraying. How To Stop Cat Biting - Discussing why cat's bite and different ways to stop your cat from biting.
" I live alone with my two cats, mira and sabastian. The Protect your pet card really helps to make me feel so much better to know that if something were to happened to me the police would know right away that my babies are at home."" "Thought the card was a great idea, bought it, the card was very attractive and fit perfectly into my wallet, I even liked the keychain, thought it was very cute." "I don't usually write reviews, but just want to drop a quick line. We really liked this product, we're proud parents of two cats and a new puppy and liked the fact that it came with two cards so that both my husband and I could carry one in our wallets. Really liked the keychain, wish it came with two."